The program organizes its simple interface into four tabs: Split, Join, Encrypt and "JPK" (pack a file or folder inside a JPEG). The Split function enables splitting a target file into a fixed number of subfiles, or you can just give FileFriend the maximum size of each subfile and it’ll figure out the rest itself. Drag or drop the subfiles into the Join panel later and it’ll restore the originals in a click. The JPK function is designed to hide files or folders inside a JPG. Point the program at a target image and the payload files, enter a password and they’ll be saved. The same pane can be used by a recipient to view a list of files in the folder, extract them, or remove them entirely (the JPEG is restored to its original state). Beware: this encryption transforms the files based on the password you provide. If you encrypt with "password," accidentally enter "passwrd" to decrypt, the program will encrypt the files twice. You’d need to use both passwords in reverse order to restore them. If the second password was a typo, you wouldn’t know what to enter and the files would be lost. This isn’t entirely bad news, as it also makes it more difficult for an attacker to decrypt the files. But keep it in mind, and only ever encrypt data if you’ve backed up copies somewhere else. 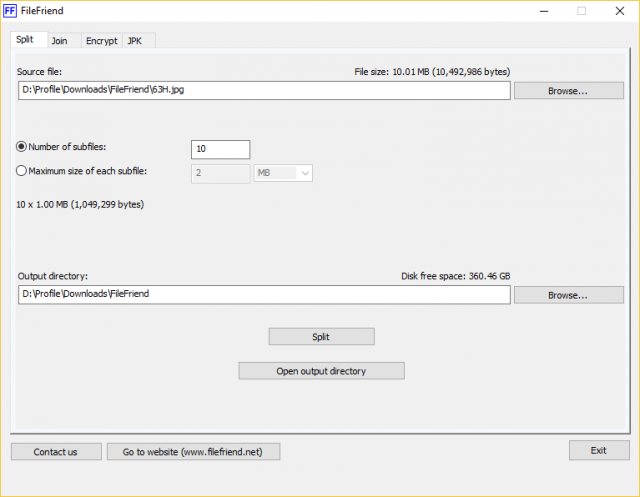 FileFriend is a free tool for Windows 7 and later.